The 3M 8210 Respirator, N95 is the most popular particulate respirator in the world! The 3M 8210 respirators are a high quality economical respirator featuring lightweight construction for greater worker comfort and increased wear time. Adjustable nose clip helps provide a custom fit and secure seal. Available in a model for smaller faces as the 3M™ 8110S. Made in USA. The 3M 8210 N95 Respirator is one of the most popular particulate respirators that 3M offers. As one of the original respirators the 3M 8210 N95 provides great protection for simple projects at a great price. We only offer genuine 3M products, authorized for sale in the U.S. and other markets, so you can be sure you are buying authentic 3M respirators. 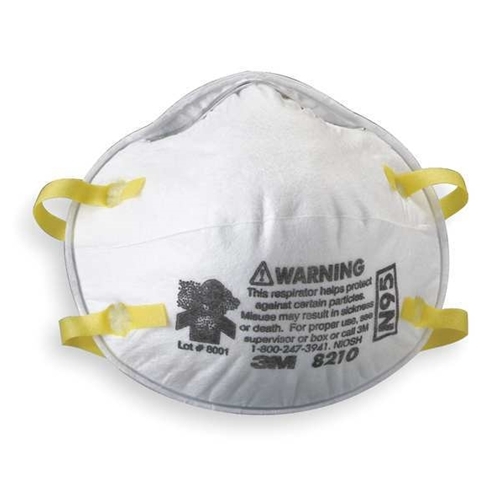 3M 8210, N95 Particulate Respirator N95 is a disposable particulate respirator that is designed to help provide reliable respiratory protection of at least 95 percent filtration efficiency against certain non-oil based particles. The 3M 8210 respirator is designed for use for particles such as those from grinding, sanding, sweeping, sawing, bagging, or other dusty operations. This 8210 respirator by 3M can also help reduce inhalation exposures to certain airborne biological particles (examples: mold, Bacillus anthracis, Mycobacterium tuberculosis), but cannot eliminate the risk of contracting infection, illness, or disease. The respirator incorporates 3M’s proprietary technology with advanced electrostatically charged microfiber filter media designed for ease of breathing. This 3M 8210 respirator is compatible with a variety of protective eyewear and hearing protection. The 3M 8210 particulate respirator is NIOSH (National Institute for Occupational Safety and Health) approved for environments containing certain non-oil based particles and provides at least 95 percent filter efficiency. In addition to the 3M 8210 N95 Respirator, we carry a full line Particulate Respirators such as, Moldex, North, Gerson and Willson, as well as other product offerings from 3M.